La Dra. Lilliam Casillas Martínez is Profesora en la Universidad de Puerto Rico, Humacao y fundadora del Observatorio Microbiológica Cabo Rojo. This summer, while on the way Playa Sucia or Los Morrillos Lighthouse, many of us will drive by the Cabo Rojo salt flats. Salt extracted from the Cabo Rojo salt from salt flats—the oldest industry in Puerto Rico—is highly pure and has great commercial value, thus making it an important source of income. But, did you know that the salt flats or salterns, as they are also known, are also a large-scalen oversized Microbiology laboratory? Dr. Lilliam Casillas Martínez, founder of the Cabo Rojo Salterns Microbial Observatory and a member of Ciencia Puerto Rico, tells us that the salterns salt flats contain great microbiological diversity. With Through her research, Dr. Casillas Martínez seeks to understand how microorganisms that live in the salterns can survive in drastic conditions of high salinity, temperature, and solar radiation. With their work, In the Cabo Rojo salterns, Dr. Casillas Martínez and her collaborators, have discovered new species of bacteria and fungi as well as the formation of microbial mats, ecosystems in which different types of microorganisms reside, one on top of another, forming a laminated structure that could be described as a "microorganism buildingcondominium". Dr. Lilliam Casillas Martínez is currently a full professor in the Biology Department of the University of Puerto Rico at Humacao, the town where she was also born, raised and went to school in. Dr. Casillas Martínez very proudly states that she is a product of Puerto Rico's public education system. After completing high school at la the Ana Roqué School in Humacao, Dr. Casillas Martínez did received her bachelor's degree in Industrial Microbiology at the University of Puerto Rico, Mayaguez Campus. After college, she worked in industry performing microbiological analysis on pharmaceuticals. Unfortunately, she was laid off after a short timenot very long after starting. Although unpleasant, this experience prompted her to apply to graduate programs in the United States. During the application process, she used Project 1000, a program that assists minority students in applying to graduate programs in all areas of science, technology, engineering, and mathematics (STEM). Thanks to Project 1000, Dr. Casillas Martínez was accepted with a full scholarship at the University of Connecticut Storrs where she completed her doctorate in Microbiology. At the University of Connecticut, Dr. Casillas Martínez joined Dr. Peter Setlow's laboratory, where she studied mechanisms of spore resistance of the Bacillus subtilis bacteria. A few years following completion of her doctorate, in 1999, she went on to form part of the faculty of the Biology Department at Humacao campus of the University of Puerto Rico. Since then, Dr. Casillas Martínez has dedicated her career to educate the new generations of Puerto Rican scientists. Soon after returning to Puerto Rico, she contacted a friend from college, Dr. Carlos Ríos Velázquez and they established a very productive collaboration: the Cabo Rojo Salterns Microbial Observatory. Since the establishment of the Microbial Observatory projectt, 104 students have been trained so far, 43 of which have continued to perform graduate studies in diverse areas of Biology. Some of her first research students, like Dr. Aramis Villafañe, have successfully obtained their doctorates and have already returned teach and do research in Puerto Rico. Aside from training college students, one of Dr. Casillas Martínez passions is to share her scientific curiosity with students and teachers of the country's public education system, an endeavor that has been very productive. Recently, her collaboration with Ms. Mayra Cancel, a teacher from the Florencia García High School, allowed Ms. Cancel to obtain funding from the Research Experience for Teachers grant from the National Science Foundation (NSF). This opportunity allowed Dr. Casillas Martínez to train Ms. Cancel and her students in the emerging field of Geomicrobiology. Her dedication towards educating future Puerto Rican scientists has earned Dr. Lilliam Casillas Martínez several awards in and outside of Puerto Rico. In 2011, she was recognized with the "Valor Humacaeño en la Ciencia Award" in her native town of Humacao; and recently the Puerto Rico Society of Microbiologists awarded her the Dr. Arturo Carrión Award for Excellence in the Teaching of Microbiology. Her most recent accolade, awarded thanks to her excellence in undergraduate teaching, was the Carski Foundation Distinguished Undergraduate Teaching Award from the American Society for Microbiology (ASM), for which she competed with college professors in all of the United States, and which will be awarded at the Society's annual meeting this month. When asked about her passion for teaching, Dr. Casillas Martínez replies that "more than teaching what I really enjoy is learning from my students". As a professor and preceptor, Dr. Casillas Martínez has created a process of interactive learning that stimulates question formulation and ignites the spark of curiosity in her students, both essential qualities of a scientist. 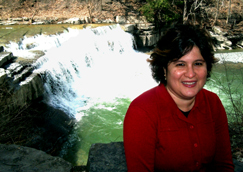 If you would like to know more about Dr. Casillas Martínez, visit her profile at CienciaPR.org and read her essays in the book ¡Ciencia Boricua! Ensayos y anécdotas del científico puertorro.